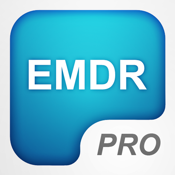 ★ ★ ★ ★ ★ "The most advanced clinician-grade EMDR solution for any mobile platform"
"EMDR For Clinicians PRO HD" is the leading clinician-grade EMDR application developed for use on iOS platforms. We have designed this application from the ground up to allow for optimum ergonomics and ease-of-use in real world clinical settings. Please note: Bilateral audio functionality may not work as expected with many commercially released stereo audio recordings. We recommend tone usage only for clinical environments. “EMDR for Clinicians PRO HD” can be used with any set of headphones, or can be plugged into computer speakers.